We test the tiny Cybershot HX99 and its 30x superzoom. At a time when everyone is carrying around a generally capable camera inside their smartphone, compact cameras have struggled to stay relevant. Barring Sony's own wonderful RX100 series and Fujifilm's X100F family, the world of point-and-shoots is usually an unremarkable one. Sony's only camera announcements at IFA 2018 were intriguing, at least. It revealed two cameras, the Cybershot HX99 and HX95, which cram a technically impressive 30x, 24-720mm f/3.5-6 equivalent zoom lens into a 1.5-inch wide camera frame that feels very similar to the premium RX100 series. Both compacts join the Cybershot camera family, meaning they are cheaper than Sony's aforementioned premium compact camera series. The HX99 -- the one I tested -- is priced at €520 (around $610), making it pretty much half the price of the latest RX100 models. I think it's important to frame this camera as one that offers imaging skills that point-and-shoot camera shoppers of the past want, but can't get from the latest smartphones. While RAW shooting and 4K video, for example, are now possible on 2018 phones, 30x zoom is not coming any time soon. The ability to zoom-in and maintain detail, meaning no cropping or digital zoom, ensures travelers and occasional family photographers can get some great shots -- especially when shooting conditions are decent. The 24-720mm zoom lens is nimble for a compact camera, and I was surprised at how quickly the compact was able to lock onto distant faces and features, bringing the details into focus. Image quality is admirable, given the compact camera's petite imaging sensor, and pushing the HX99 to its superzoom limits. The crucial part is that the superzoom offers shots that are impossible on your iPhone or Galaxy S9, let alone the ability to record (admittedly pretty wobbly) 4K video from a distance. This meant I could really hone in on the model's faces at Sony's IFA booth. I could also see it working for taking photos at weddings, or getting close-ups on animals at the zoo or in the wild. It has the potential to be a very useful camera that you can still slide into a pocket or a bag -- alongside your phone. Aside from the small 1/2.3-inch sensor, the number of features that have been squeezed in is impressive: optical image stabilization built-in; you can shoot RAW images; a 10fps burst shot mode and 4K video capture. There's also a pop-up electronic viewfinder and flash. My slightly old RX100 Mark II doesn't even have an EV. Unlike the HX95, the HX99 includes a lens ring, which lets you adjust aperture, ISO and other manual settings without having to paw at the buttons and screen. (Meanwhile, there's still the life-saving touch-to-focus feature on the tilt-able LCD display.) The UI and general feel will be familiar to anyone who's used a Sony camera in recent years. It's not perfect, but most of the features you need can be accessed with only a few actions. 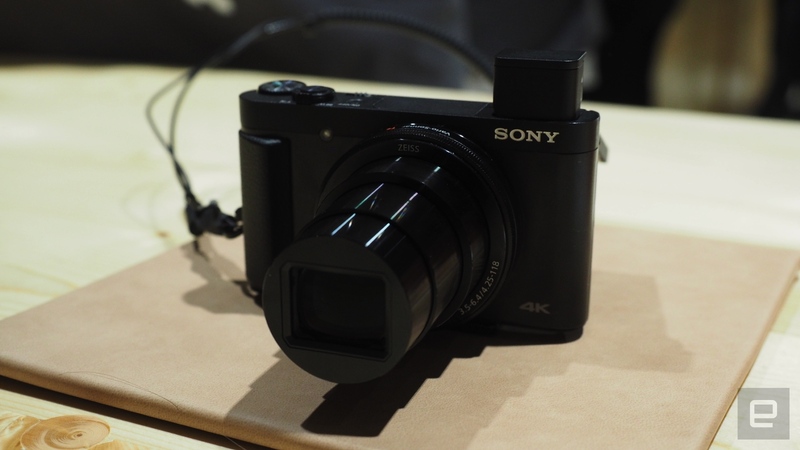 Sony's now reached the sixth iteration on its premium RX100 compact range, so the company firmly believes there is still a place for pocketable cameras even in the era of smartphones. The HX99 is a cheaper shooter that doesn't have the technical prowess and image quality of the RX100 series, but does bring the superzoom into an exciting new form factor. The HX99 might not the cheapest Sony point-and-shoot, but for many of us, it could be the most useful.